"Letting women know they’re not alone is our prime objective," says Cunningham. Mary Cunningham is the author of the popular 'Cynthia's Attic' tween fantasy/time-travel series. She's also the co-author of the soon-to-be-released book, WOOF: Women Only Over 50, an uplifting collection of personal anecdotes and poems about how it feels and what it means to be a woman in her fifties. Mary lives in the beautiful mountains of West Georgia and is a member of The Society of Children's Book Writers and Illustrators, The Georgia Reading Association, and the Carrollton Creative Writers Club. Thanks for this interview, Mary. Tell us, who came up with the idea for the WOOF book? memory is the first to go!) but I’ll do my best. 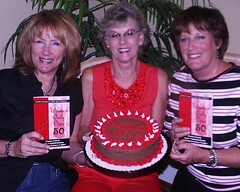 Co-writer, Diana, and her friend Carol were discussing the “joys” of reaching the half-century milestone. Their commiserating and laughter resulted in the idea to form a club/support group of friends who are still puppies at heart, beginning with themselves, another friend, Dot, and me. Melinda soon joined the ranks. The WOOFers Club soon led to the book. 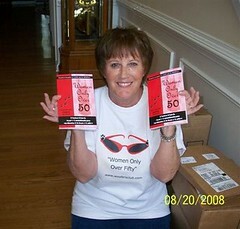 The first edition of WOOF: Women Only Over Fifty was published in 2000. An updated, (translation: BETTER!) edition will be published DEC 1, 2008 by Echelon Press. The book has been a complete collaboration with Diana Black, Melinda Richarz Bailey, and me. How was it writing a book with two other authors? Would you do it again? There were some rough patches on our first go-round several years ago… imagine three “divas” trying to write a book together! But, we learned tons from that experience! The new and improved WOOF has been a total pleasure. We had a purpose. To make this book the best it could be, and to reach women who are creeping up on Fifty, or have already stumbled over the line and need a good laugh. What was the best part about writing this book? The best part, for me, was writing stories and poems from personal experience, and realizing that being fifty doesn’t have to be depressing. It can actually be funny, and more importantly, freeing! I’ve gotten beyond worrying about what other people think of me, and I hope readers will get the same message and learn to howl at the aging process. Your WOOFer name is 'Milkbone'. Why and what's behind the names? The acronym for “Women Only Over Fifty” is WOOF. We use canine terms and analogies in stories and chapter titles, such as, Are We Barking Up the Wrong Tree? Purebred Potpourri and Over Fifty Tailwaggers. In the process, the natural evolution was to give ourselves dog names. Diana is d.d. dawg, Melinda is Mad Dog and my name, Milkbone, comes from one of my favorite expressions. It’s a dog-eat-dog world and I’m wearing milkbone underwear. What's all the fuss about the WOOFers Club? Who can join and what do they do? The club is for anyone wishing to join a sisterhood for the ever-increasing number of women approaching or over Fifty. We have our own e-mail address, [email protected], where women can choose and register a WOOF name of their choice and also vent frustrations, tell their own funny story, or submit poems. We’re also planning to run contests in the near future. Do you have to be at least 50 to join? No. If you're approaching 50, or just dreading (or embracing) the thought, you're welcome to join. WOOF also has its own blog. Tell us about this. What do WOOFers blog about? Oh, I love the blog! We not only write posts about our own over-fifty experiences — good and not so good — we invite all women to be guest bloggers. For instance, we’ve had an over-fifty woman relay her experience with TaeKwondo, and we’re so open-minded, we even posted a blog about a special cat, Dewey Readmore Books. So, gotta story to tell? E-mail us at [email protected]. We will be choosing one or two guest bloggers each month. I hear you've done a few signings already, before the official release of the book. What has been the response from the public so far? Is there anything else you'd like to tell our readers?